Good Evening Everyone! Tonight I have something EXTRA special for you all! 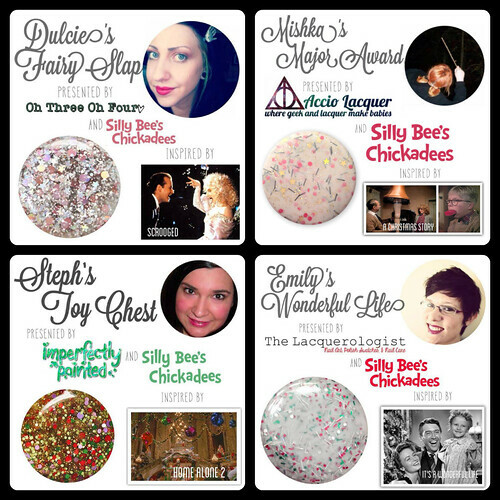 Awhile back, Melissa of Silly Bee’s Chickadees asked me if I would be interested in collaborating with her for her blogger-inspired Christmas collection. Of course I said yes! We were tasked with deciding what our favorite Christmas movie was- and then deciding what our favorite scene of that movie was. The BEST part about this collection- is that each blogger was able to pick a charity for proceeds from their polish’s sales to be donated to! 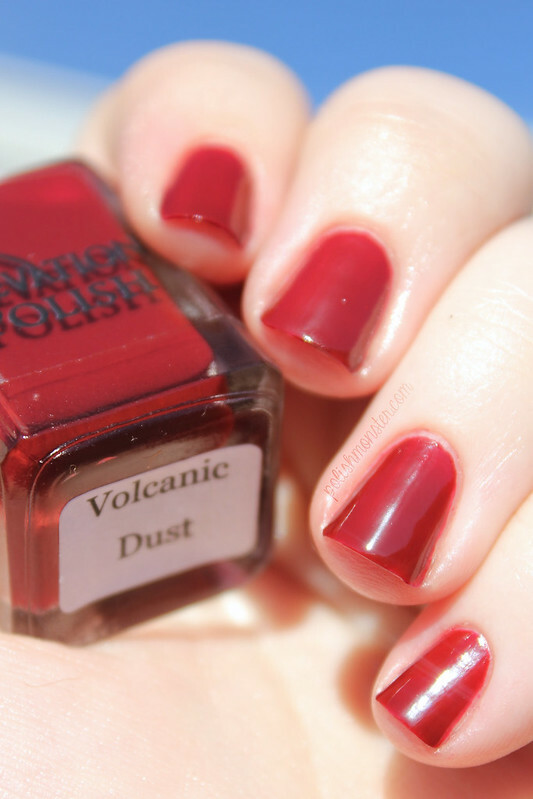 20% of each $10 polish will be donated to the charity of that blogger’s choice. For the proceeds of my polish, I chose Toys for Tots. It’s Christmastime, and that was the first thing that popped in my head. It’s also one of the charities my family donates to each year. My children (ok- mostly my oldest, my son is still too young to ‘get’ it) help pick out toys and bikes each year for Toys for Tots and our local Bikes or Bust campaign. The holidays are a hard time of year for many families- during December we try and help out where we can. Along with myself, the bloggers contributing to the Gift of Melly collection are Dulcie of OhThreeOhFour, Mishka of Accio Lacquer, Stephanie of Imperfectly Painted, and Emily of The Lacquerologist! This collage shows their polishes and the scenes that inspired them. Be sure to check out their posts! And so from that scene inspiration- Melissa created Diana’s Nippley Holiday! Diana’s Nippley Holiday is a very light blue crelly base, filled with hot pink flowers, red, green, and white circle glitter, white hexes, and gold magic dust. To be totally honest, I did have a little bit of trouble initially with my pretty polish- it got thick quickly after it was opened, so I added a bit of thinner to make things work well. Melissa has fixed the other bottles to ensure they all apply wonderfully, so this shouldn’t even be an issue for you! Once I added a touch of thinner, application went well. I used just over 2 coats for these photos (but not quite 3 full coats), plus topcoat. I didn’t have to do any fishing for the flowers or other glitter- they all came out easily! These polishes are being released on November 15 at 11am CST. You can buy each individually, and there are also limited amounts of box sets that contain all of the polishes, plus a few surprises! Here’s all the Silly Bee’s info- be sure to check it out! Melissa was kind enough to send me 2 bottles of Diana’s Nippley Holiday- one for me, and one for one of you! Just follow the link to the Rafflecopter widget and enter! Giveaway is open internationally, you must be 18 years or older, or have parental permission to enter. The giveaway will run through November 25th at 12:00am! Hello everyone! 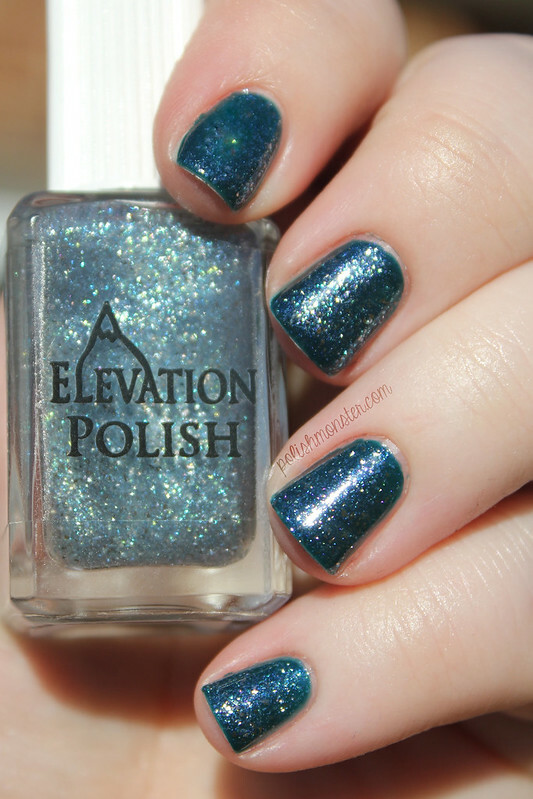 Today I have the gorgeous new polishes from Elevation Polish to show you all! The Naughty by Nature collection was just released on Thursday. I *really* wanted to have this post up on release day- but the universe had other plans! My family was super sick the whole week- and by the end of the week of taking care of them, I was down for the count too. But better a little late than never! There are 6 BEAUTIFUL colors in this collection- and the exciting part is that they’re all water based! I don’t know about you guys, but my experiences with water based polishes in the past haven’t been that great (though they’ve also been limited). 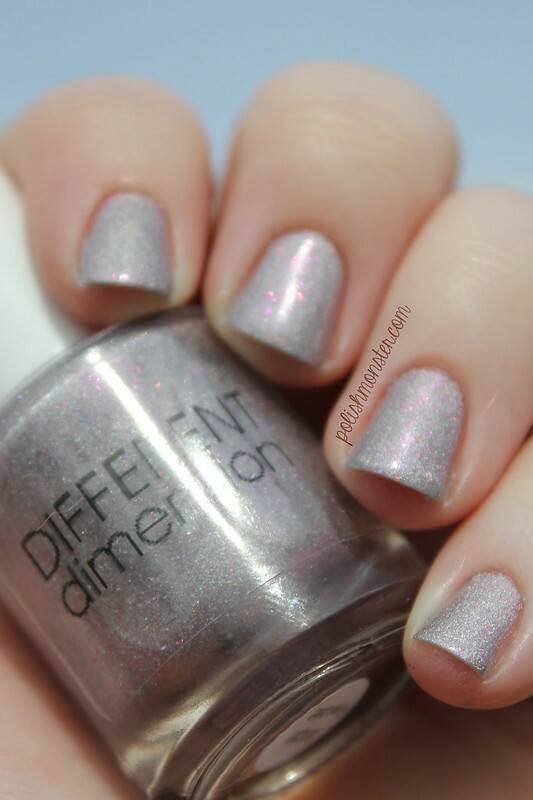 I could barely tell a difference between these polishes and other Elevations! I did notice that all 6 got a bit thick when exposed to air more quickly than my ‘normal’ polish does, and a few were thicker in general. I probably will add a few drops of thinner later (I did not for photos). That’s more of a personal preference- as you can see from the pictures, they all apply wonderfully! I could barely smell a polish smell at all (it was very subtle), and the dry time was just fine. Lulu has really impressed me with these- and that’s just the formula, not the beautiful colors! First is Forest of the Fog- a beautiful teal jelly polish filled with blue and purple shimmer. This polish is so pretty! I really love the purple shimmer with the teal base- it’s a fun combination. The shimmer is definitely a little shy- it’s noticeable, but it’s not super in-your-face and instead is more subtle. These photos are outside in the sunshine, which is why it’s cooperating! Inside, you have more of a dark teal jelly polish. Photos show 2 coats with no topcoat. 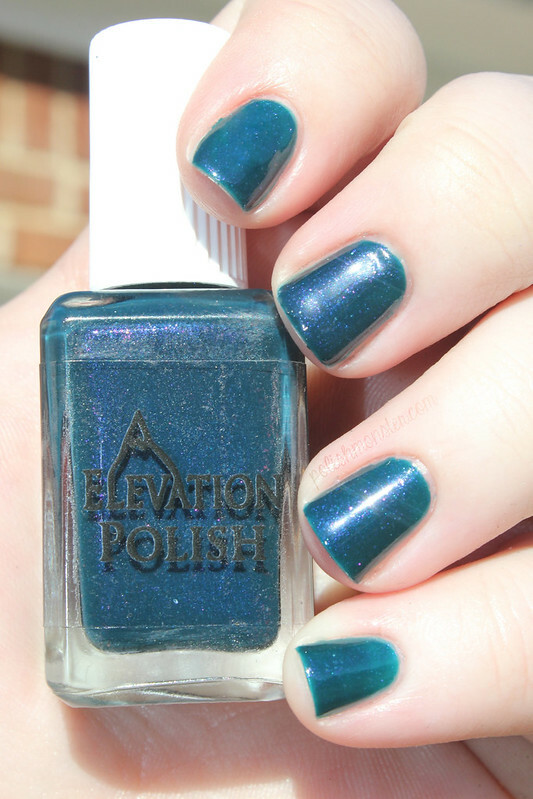 Then I topped Forest of the Fog with Pitaraq, a gorgeous flake topcoat! After years of being a polishaholic- my love for flakies of all types has never diminished. So of course, this is one of my favorites of the collection! 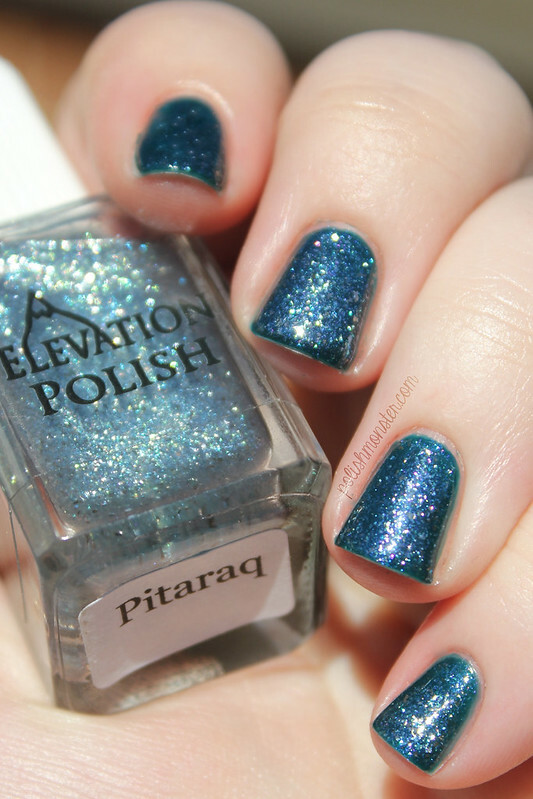 Pitaraq is a fun topper filled with white, silver, and blue flakies and blue microshimmer! This polish will be PERFECT for the winter months coming up- it feels like I just spread frost over my nails! This is 1 coat (no topcoat) over Forest of the Fog. Next is a wonderful red cream, Volcanic Dust! This polish really surprised me and was another favorite in the collection. I’m normally not a fan of creams- I have a good amount of them, but I rarely get excited for them. But Volcanic Dust looked great on, and applied great! Pictures show 2 coats with no topcoat. 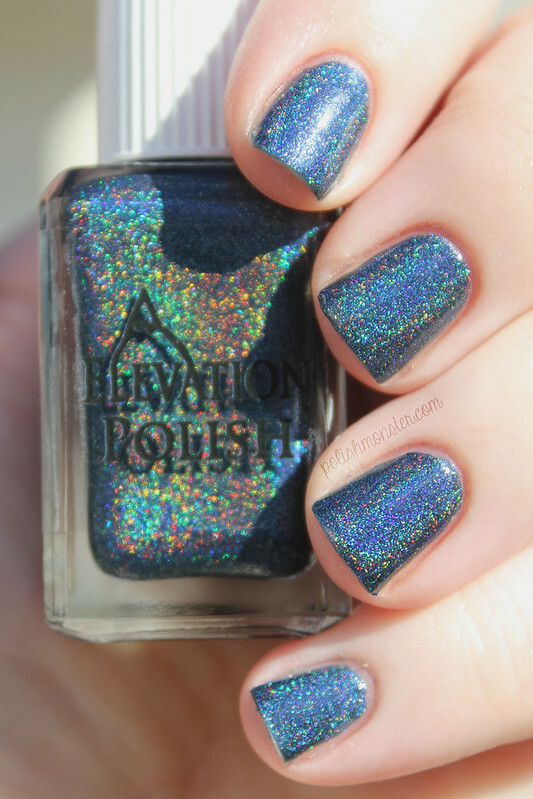 Ah, and now for my favorite of the collection- Darkest Storm, a beautiful dark blue holographic stunner! Darkest Storm is a very dark, almost midnight blue holographic polish. Because of the darker shade, the holographic effect is blinding outside in the sun! Photos show 2 coats with no topcoat. Next is Black Ice, a charcoal polish filled with lots of shimmer! Black Ice dries to a velvet matte finish on it’s own. I ADORE how it looks with topcoat on top though! This beauty sparkled so much in the sun that it almost looks holographic. But it’s not! It’s filled with a silver and white shimmer that is always visible, and also with multicolored shimmer that comes alive with topcoat. This polish applied like a DREAM- I didn’t have to do any cleanup at all! Photos are 2 coats with topcoat. Last but not least is Naked Night Sky, a brown jelly polish accented with aqua and blue glitters! I actually ended up liking this polish a bit more than I had anticipated- unlike Lulu, the creator, I don’t love brown nail polish (her blog is http://lovebrownnailpolish.wordpress.com/ lol). But I did really like this! On her store listing, Lulu advises to wait for each coat to dry before applying the next one, and I would agree with this completely. This polish is actually the only one that gave me a bit of trouble, and it was because I was initially not following that advice, and the second coat would pull and ruin the first coat. Once I waited, I had no more issues. Photos are 2 thick coats plus topcoat. And there you have it, the Naughty by Nature collection! As I said earlier, these polishes were released on Thursday- Darkest Storm is sold out for now, but the rest are still available! 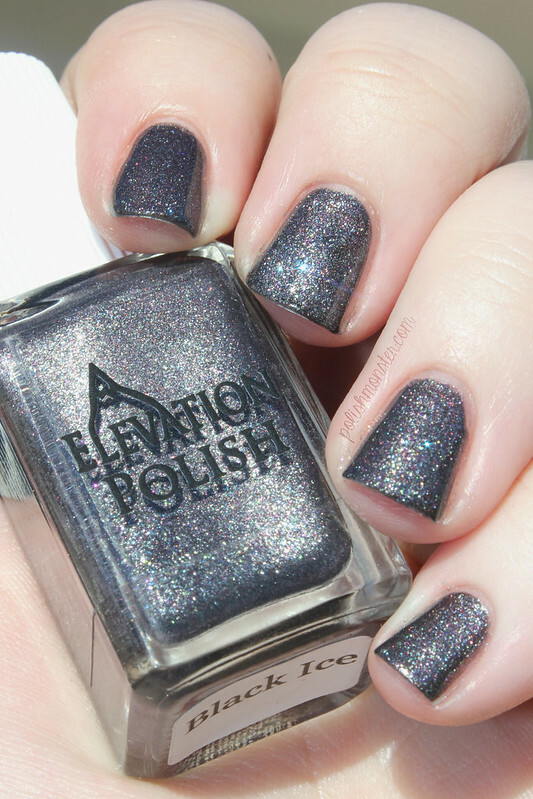 Elevation Polish restocks on the 7th and 22nd of the month, so Darkest Storm will be available again then. The collection is also going to be launched at Llarowe.com, though I don’t believe the restock date has been announced yet. 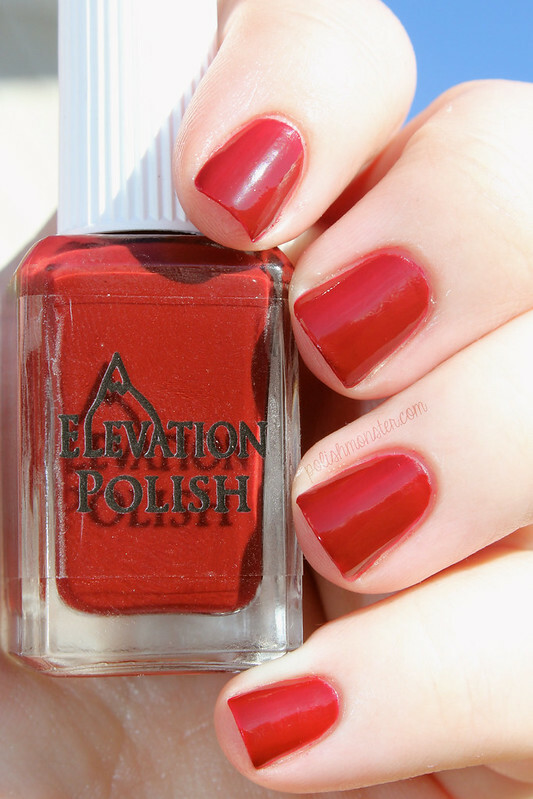 Also, Elevation Polish is now on Instagram! 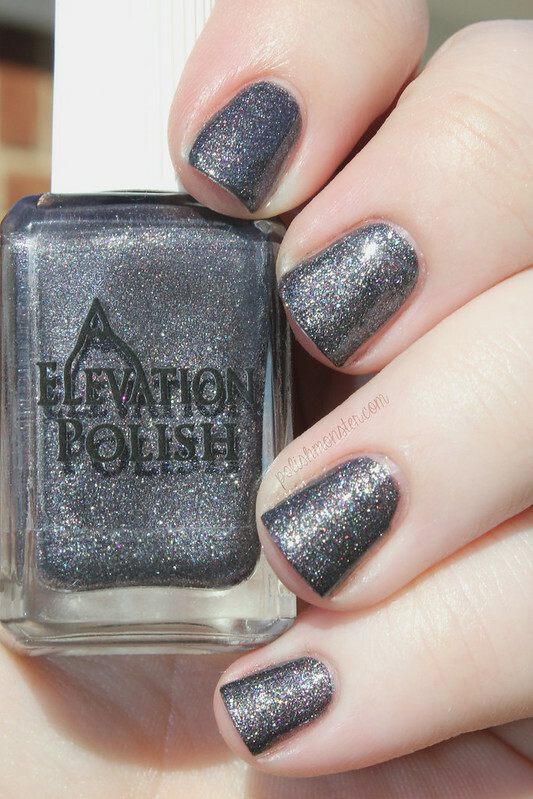 Be sure to go follow- @elevationpolish! Femme Fatale Cosmetics Swatches and Review! Good evening everyone! Today was the last day of Blizzcon, the annual convention for all fans of Warcraft, Starcraft, and Diablo! I’ve mentioned before that I’m a very long-term World of Warcraft player- I’ve been playing since just slightly after launch (so *gulp* over 8 years now)- and still actively play. So of course, this weekend was full of excitement as I watched the events on my computer via a virtual ticket (traveling to Anaheim is just not in the cards right now! )- and I decided there wasn’t a better way to celebrate than to do a subtle World of Warcraft post! While not created specifically for World of Warcraft- if you’re familiar with Femme Fatale Cosmetics and play World of Warcraft, some of the names and themes may seem very familiar. The owners play, and often let the beautiful places and things within the game inspire the creations! First up tonight we have Aqueous- a beautiful blue crelly polish filled with teal, navy, blue, magenta and pink glitters. Application was wonderful. I got plenty of extra large pink glitters with absolutely no fishing- I even had to put a few back! I didn’t have to worry about dabbing, I applied like I would a normal cream polish and got wonderful glitter placement. My photos show 2 coats with topcoat. Next is a long favorite of mine- Spring Fling! Spring Fling has been a favorite Femme Fatale color of mine for awhile now- I love mint greens! And adding pink? Must be meant for me 🙂 There’s also plenty of white glitters, diamonds, and micro neon green glitter! Application was wonderful again- the only issue I had (if this is even an issue?) is that I had so much luck with the larger glitters, I had to start putting diamonds back into the bottle. My photos show 2 coats with topcoat. Next is Witchful Thinking, a beautiful glitter topper filled with grey, silver, black, glitters and shimmer! Witchful Thinking is part of the 2013 Halloween Trio. My first and last picture show 1 coat of Witchful Thinking over Elevation Polish Darkest Storm, and the middle photo shows 1 coat of Witchful Thinking over Cult Nails Nevermore (plain black). 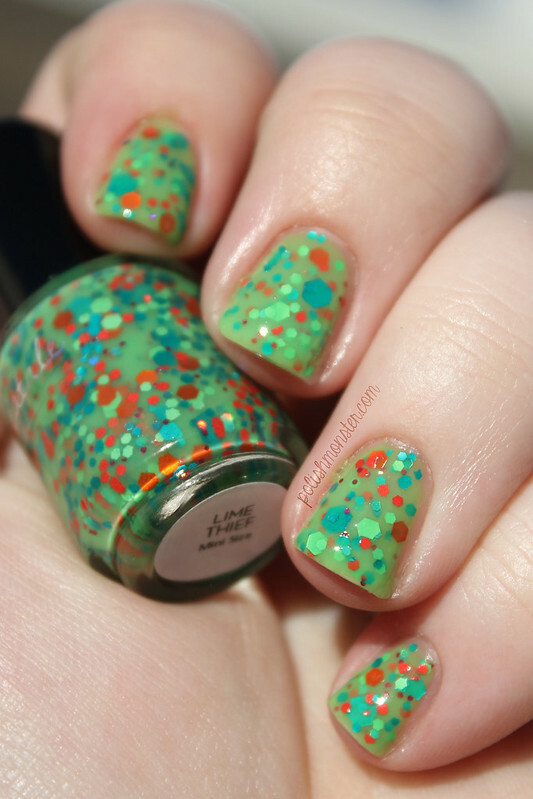 Last but not least is Lime Thief, a beautiful lime green jelly polish filled with green and orange glitters! Pictures show 2 1/2 coats with topcoat (I added a thin 3rd layer just around my nail line, but not a full coat). Application was amazing- no fishing, no dabbing, no cleanup- just normal application. Perfection! Femme Fatale Cosmetics not only sells their own beautiful nail polishes, they also offer an amazing line of mineral based cosmetics (I own about 15 of their beautiful eye shadows, they’re wonderful! ), and they’re also now a nail polish stockist for Australia! They offer local and imported nail polish to Australian customers, including Emily de Molly, Enchanted Polish, HARE, and Girly Bits among many others! So what do you think? Any favorites from Femme Fatale? I’m also really loving their beautiful holos that they’ve recently released! Good afternoon everyone! I hope to have another post up this evening, but while I’m waiting on the sun to come back out- I thought I’d post some pictures I recently took of one of my very favorite collections! 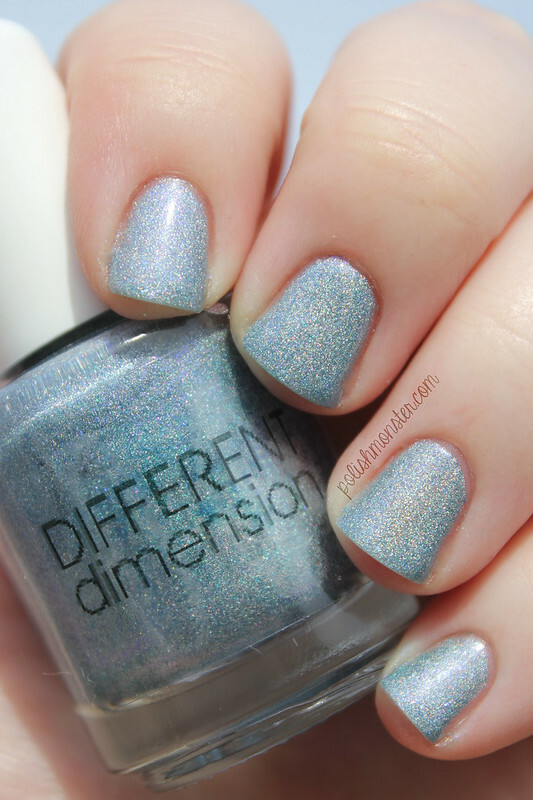 Different Dimension’s Set It Free collection was first released last February- though it is still available! This stunning collection is made of 3 polishes- Black Dahlia, Wide Awake, and Stronger. I love everything about this trio of polishes- they’re holo, sparkling, shimmering bottles of beauty! First up is Black Dahlia. This is probably my favorite of the collection. While I feel like you should get all 3, if you can only get 1- make it be this one. Black Dahlia is a beautiful black flake polish (the flakes in all 3 build up to opacity in just 2 coats), filled with tons of holographic pigment, blue/pink shimmer, and color shifting glitters. This polish comes alive outside, but it is just as beautiful indoors too. I used 2 coats with no topcoat for these photos. As with every Different Dimension polish I’ve tried, the formula was perfect and went on wonderfully with no issues. Next in the trio is Wide Awake. Although this is a pink, this is probably my least favorite of the bunch. Shocking, right? Wide Awake is absolutely beautiful, but didn’t want to play nice with my skin tone. That’s the only negative thing about it though- because it’s just as stunning as it’s siblings, and applies like a dream. Wide Awake is a very pale pink holographic polish filled with light pink flecks and a hot pink flash (seen best in the photo below). As I said before- application was wonderful. Photos show 2 coats with no topcoat. Last but not least, is Stronger. Stronger is a *stunning* light blue holographic polish filled with blue flecks and a blue/pink flash. Like Black Dahlia, the strong holographic pigment plays very nicely with this shade, and it’s almost always visible- even indoors a bit. The pop of pink is not subtle, and is so beautiful! Like the others, application on Stronger was amazing. Every polish I own by Different Dimension is like this, so I’m not surprised! Photos show 2 coats with no topcoat. Though Missi has been pumping out some AMAZING holographic colors lately- I highly recommend you pick up at least 1 of these beauties! You won’t regret it! 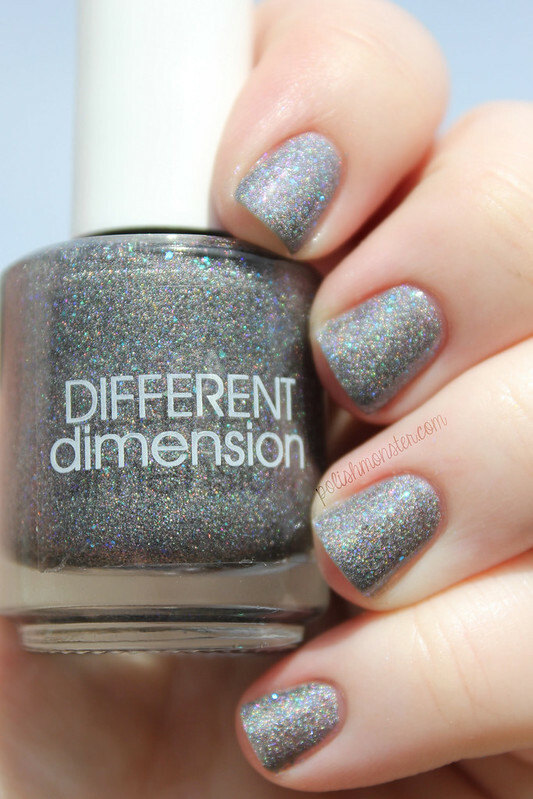 Different Dimension polishes are available at Different Dimension’s Etsy shop and range from $8.50 to $10.00, as well as Llarowe and Mei Mei’s Signatures. Be sure to follow Different Dimension on Facebook, Twitter, and Instagram for updates and sneak peeks at upcoming shades! While Halloween is over, Dia de los Muertos is still being celebrated- so I decided to bring out Lumina Lacquer’s Sugar Skulls 2.0! The original Sugar Skulls was offered last fall, and was very similar to the 2.0 version. 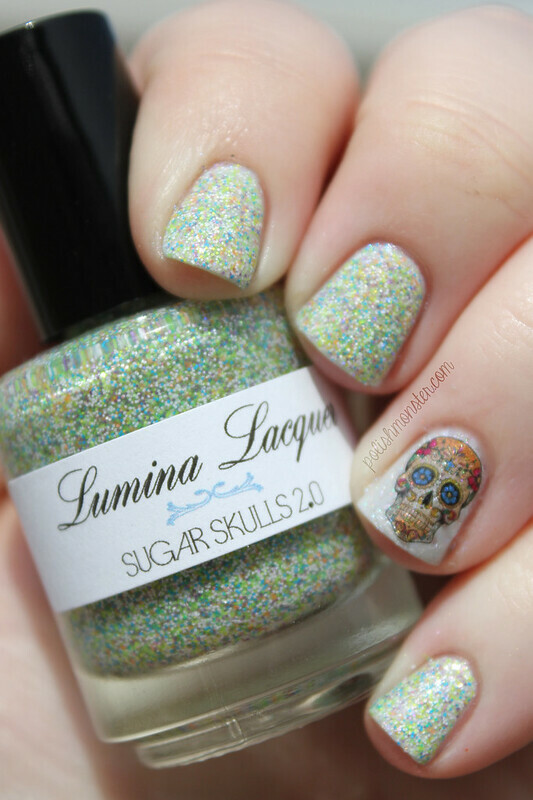 Sugar Skulls 2.0 is filled with small matte glitters in white, blue, green, pink, and a hint of color shifting sparkle. I had always wanted the original but never bought it- so I grabbed up this one when it was released! Photos show 2 coats of Sugar Skulls 2.0 over Different Dimension’s Excelsior (which will have it’s own post in a few days), with a Sugar Skull Nail Thins as on over Excelsior as an accent nail. Application was great, the coverage on Sugar Skulls was wonderful- sometimes with micro matte glitter polishes, it can take a lot of coats to build up a decent opacity- but 2 thin coats was all that was needed. The Nail Thin was incredibly easy to apply again- but this time, while in a hurry, I didn’t wait for the base polish to completely dry before applying. It still worked well, but I had a bit of smudging- completely user error on my part. I highly recommend giving them a look! You can get 3 packs for $10 on Etsy, and there’s tons of fun things to choose from. Coming up this weekend I’ll have posts featuring Femme Fatale, the upcoming Elevation Polish collection, and some beautiful colors from Different Dimension- be sure to check back!